On April 2nd the president of the University of Minnesota, Eric Kaler, will be delivering his annual “State of the University” address to both the campus community and to important actors in state politics and big business. Students for a Democratic Society at UMN knows that this “State of the University” will neglect the issues impacting students, staff, and faculty at the university today. In response to President Kaler’s address, SDS will be bringing together students to highlight and speak to the work, concerns and struggles they are engaged at the university and in the community. Concerns like discrimination, inaccessibility and livable wages for staff and faculty who make our university work. 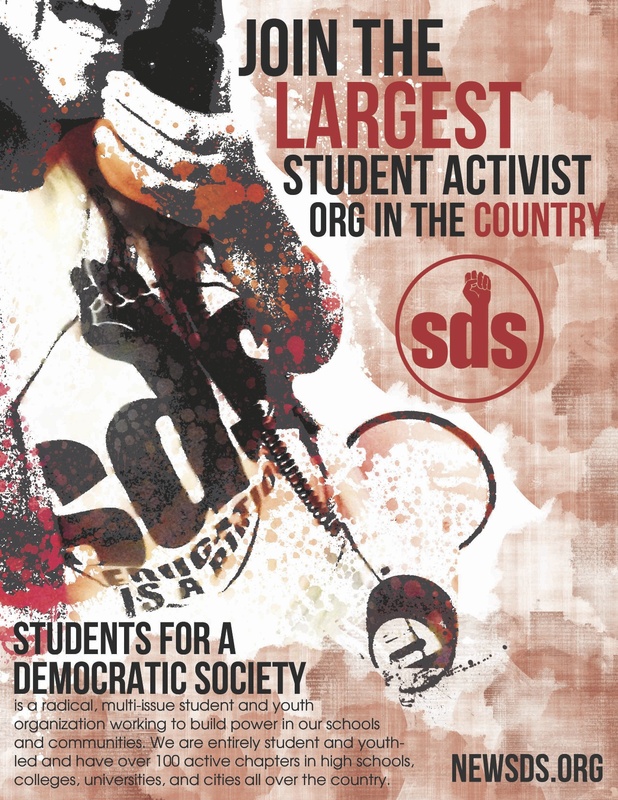 SDS will join other groups to highlight the work that represents their needs and their issues in a “Students’ State of the University.” The “Students’ State of the University” will be held immediately after the officially sanctioned scripted deliver of President Kaler’s media spectacle in order to highlight the growing gaps between administration and students, staff and faculty at the university. Amongst the disparities we will highlight are responses to the typical rhetoric of President Kaler and his administration. Rhetoric about issues like “Campus Climate,” which has been veiled rhetoric referring to access, diversity, inequalities and safety at the university. In his 2014 address he stated, “Advancing equity and diversity is a priority of mine… too often, students of color come from families of limited means. Thus, a necessary step to increasing the number of students of color is to make the University more affordable.” However far from building bridges to communities of color he and his administration have held the line and even gone as far as attacking students of color. Kaler stated that in order to achieve this goal, “the environment of campus could be more welcoming.” His idea of a welcoming environment has included white washing the diverse cultural centers that provided safe spaces for our diverse student body. It has also included ignoring the groups like Whose Diveristy? who have worked extensively to create an inclusive environment. Kaler has gone further then ignoring the group, he had several of its members arrested in a peaceful sit-in at his office. For Kaler, arresting students of color who work tirelessly to challenge the university to achieve his “priority” of advancing equity and diversity on campus is having them arrested in attempts to engage in meaningful change that goes beyond rhetoric and empty dialogue. Kaler has also “changed” crime alerts, to exclude race, “in some cases,” and will likely trump this as an act of inclusiveness while being able to uphold “safety” as a standard for a largely middle class white student population. Despite this many students, including a group of doctoral students have highlighted that research has show race in crime alerts is far from effective and actually does not correlate to proper suspect identification. This gesture was made as a meaningless concession to those, like Whose Diversity? and others that have highlighted the impact of race as a description used in crime alerts for students of color on campus. Far from creating a “welcoming” environment it creates one of unwarranted suspicion of students of color from their white peers. President Kaler also spoke about a “Strategic Plan” last year in his State of the U speech. The stated goal was to be “faculty driven” and that it was extremely important that “staff, students and stakeholders voices are there too.” Yet these voices have been routinely ignored. The university staff remain under-compensated and routinely have to fight the board of regents 3 minute time limit for their voices to be heard and subsequently ignored by university leadership. President Kaler has also done little to trim excessive administration bloat and golden parachutes while maintaining the status quo for the already outrageous tuition charged by the university. Far from “rejecting complacency” President Kaler has upheld it. President Kaler and his administration have most notably upheld complacency in their response to research misconduct and systemic and institutional negligence. A review of these practices, including those that saw research subject Dan Markingson die in 2004, wrote that “weakness in policy and practice were evident and require attention,” adding that “in the context of persistent internal and external criticism…the University has not taken an appropriately aggressive and informed approach to protecting subjects and regaining lost trust.” Voices within the university including students, staff and faculty have been joined by a chorus of concerned community members including former Governor Arnie Carlson to publicly demand accountability and outside investigation of misconduct. Most recently at a Faculty Senate hearing many staff went as far as demanding accountability from the top, including resignations. While President Kaler likes to talk about “Grand Challenges” and rhetorically wage a PR campaign to appease corporate donors and state lawmakers. President Kaler has upheld a “tuition freeze” as his great achievement for students. Far from making the university more accessible, it has maintained the status quo. The bottom line remains that over the past decades tuition has risen at outrageous rates, far exceeding inflation and mirroring increases in administrative costs. A real victory to celebrate will be when tuition is decreased. Further, Kaler and his administration have remained idol in trimming top heavy spending, offering livable wages and benefits to staff and their families, creating an inclusive environment for a diverse students body and they have consistently failed to hold themselves accountable for academic and research negligence and misconduct which undermine the very foundations of our university. The time for hollow rhetoric has passed. President Kaler has proven himself to be just another scripted talking head that is unwilling to take the necessary actions to meaningfully address “Poverty. Social Inequality. Religious intolerance. World Hunger. Climate Change. Disease,” and the other challenges he highlighted in his opening remarks of his 2014 address. For those that are tired of such empty PR media spectacles to boost alumni fundraising and corporate donations, join SDS and its partners in our “Students State of the University” on April 2nd following Kaler’s speech. Let’s discuss the real issues and begin doing the work necessary to build a better, more tolerant, more inclusive, more accountable and more accessible university and community. Join us at 6pm on April 2 in Ford Hall. Students for a Democratic Society at the University of Minnesota demands justice for unarmed 19-year old Tony Robinson who was killed by police Friday March 6 by police in Madison, WI and an end to all racism and injustice plaguing our campuses and communities across the country. 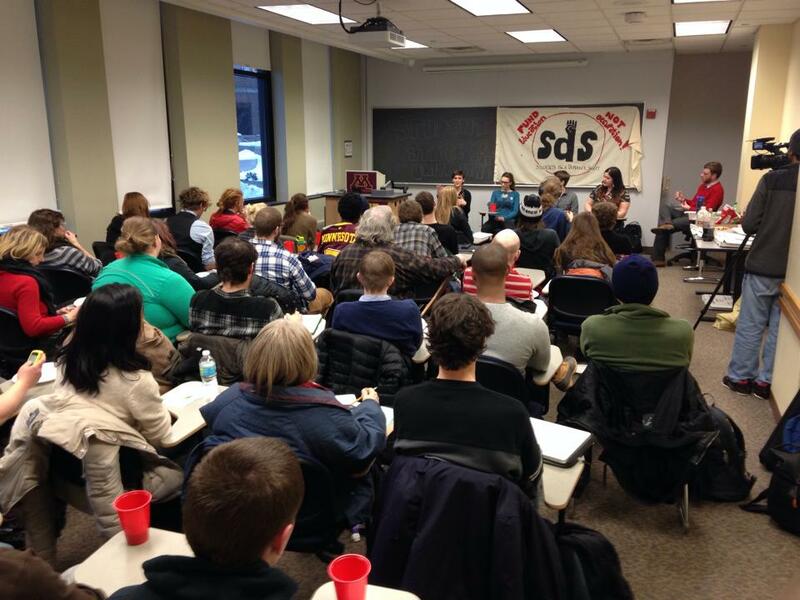 UMN SDS stands in support of students in Madison and everywhere who are standing up and walking out to demand justice. Justice begins in every community with equal access to resources. Youth of color are subjected to the injustice of major failures of education from the achievement gap to the school-prison-pipeline when young people of color are criminalized. They are also subjected to an opportunity gap in higher education and access to equal economic opportunities. Finally they are subjected to the repression and violence of the state through racist police practices seen in the forms of harassment, violence and disproportionate policing of communities of color. People of color are confronted with injustice and inequalities in every aspect of American society from the education and legal systems to the capitalist economic structure that puts profits over people. In education for example students of color face a major achievement gap in a system that excludes and marginalizes their culture, history and values. In Minnesota for example, amongst the worst states in the education achievement gaps graduation rates for ELL students is 64%, 60% for Latino/Latina students, 60% for black students, and 50% for American Indian students. Nationally students of color are disproportionately disciplined for activities that are no different than their white peers. Black boys for example are 3.5x more likely to be suspended. They account for 46% of suspensions while composing only 18% of the student population nationally. This is due to racist practices institutionally and also racist practices from teachers individual bias. These systems and practices criminalize youth of color and contribute to higher drop out rates for students of color disrupting their potential for success. In the legal system injustice and inequality are best demonstrated by incarceration rates. The US incarcerates the higher proportion of its population in the world. The US accounts for 25% of the worlds prison population while only having 5% of the world’s population. Of the 1.2 million people in prison 58% are people of color. While only 12% of the total US population is black over 40% of those arrested are black. Black men are incarcerated at a rate 6x higher than their white peers. One in ten black men have been incarcerated in the US. Studies and research have found consistently that the rate at which crimes are committed is constant across racial demographics but enforcement is disproportionately focused on communities of color and communities in poverty. The recent DOJ reports about Ferguson highlight this fact but also offer a case study that is institutionally routine across the US today. People of color are also more likely to be killed by the police. These are the results of systemic and routine practices. Over the past 40 years a black person is on average 4.2x more likely to get shot and killed by law enforcement than whites. While 13% of the US is black, they account for 26% of police killings. American Indians are the most likely oppressed nationality to by killed by police in the United States. They account for .8% of the national population but 1.9% of police killings. These “justifiable homicides” are nothing more than systematic murders rubber-stamped by the legal system echoing a long history of racist violence and terrorism in US history. Economic inequalities have been consistently maintained since the days when US capitalism boomed on a slave based economy. Since 1989 peak values of wealth ratios were reached and have been in decline ever since. For example he unemployment rate nationally has fallen around 5% in 2014 but is below 5% for white communities while remaining at over 10% for black communities and over 6% for Latino/Latina communities. The median wealth of white households in 13 times greater then that of the median wealth of black households and 10 times greater than that of Latino/Latina households. In the years since the end of the “great recession” in 2010 median household earnings have fallen in the black community by over 50%. Median wealth has fallen as well representing both a decrease in earnings and savings. Across all communities of color in the US since 2010 median household incomes have fallen. Home ownership rates have likewise fallen for communities of color. These trends represent a renewal of segregation in US society that represents systemic oppression and exploitation of communities of color. The results are felt in communities like Madison, WI not only when their youth are killed but in everyday life. Madison is only a short distance away from Wisconsin’s largest city Milwaukee, one of the US’s most segregated cities. A city where police have routinely terrorized communities of color and killed unarmed citizens. Among them is Dontre Hamilton, a 31 year old suffering from mental illness who was murdered in a downtown park. Another is Derek Williams who died in the custody of Milwaukee police pleading for help because he could no breathe. Milwaukee police have a long and well-documented history of brutality towards communities of color. These practices of police brutality are only symptoms of the greater social injustices and racism in US society today. Racism and inequalities are the plagues of systems of colonialism, imperialism and capitalism ravaging our social fabric today. We must end racism and injustice across our society by challenging them everywhere they exist. Every institution perpetuating these plagues must be challenged and SDS stands firmly opposed to it anywhere it exists. We’re committed to taking on racism and injustice on our campuses, in our communities and across our country or anywhere else it exists. We demand justice for Tony Robinson and all those brutally murdered by police and state violence. We demand an end to the harassment, intimidation and attacks on communities of color. We demand and end to all practices of racism individually and collectively in our society. We affirm our commitment to the struggle for justice and the destruction of racism! When communities of color are under attack, we join with those who stand up and fight back! Students for a Democratic Society at the University of Minnesota condemns the racism of the Sigma Alpha Epsilon (SAE) at the University of Oklahoma. UMN SDS demands accountability from all institutions of higher education regarding racism and discrimination on our college and university campuses. The Sigma Alpha Epsilon is a fraternity founded in 1856 and boasts a history of racism and exclusion of members of color. In 1903 the fraternity proudly upheld itself as a group reserved exclusively for “members of the Caucasian race.” Since then it has continued nationally to exercise racism in practice. For example in December 2014 the Clemson chapter was suspended for holding a “Cripmas” party, themed with Crip gang culture and appropriating black culture. Since the OU incident students in a Seattle area chapter of the fraternity have been accused of a similar incident of racism. The racist remarks of its members at the University of Oklahoma represent a Greek culture that systematically remains segregated and largely excludes people of color. At all institutions of higher education we must uphold values of tollerance that say no to racism and discrimination. The administration of our universities must condemn all racism and uphold a zero tolerance policy for any such racism, discrimination and intolerance.When fraternities and sororities, like SAE, contribute to a culture of racial injustice and exclusion, SDS demands that our universities act immediately to stifle their influence by penalizing these institutions and removing them from campus life. Students for a Democratic Society opposes racism and demands racism off campus!